The mosses, or musci, form a subdivision of the plant group Bryophyta. They are very numerous. While possessing simple stems and leaves, they have no true roots. Mosses are anchored in their growing positions by rhizoids which are hairlike and without color. The physiological activities of roots are carried out by these. It should be noted that true mosses and the club mosses are different; the latter belong to the family Lycopodiaceae. Mosses are, in the main, terrestrial. 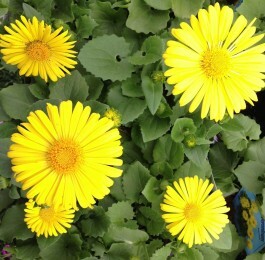 They thrive in damp conditions, though some kinds do not necessarily demand constant moisture. Moisture is necessary, however, when fertilization is to occur. But where spore dispersal is concerned, physiologically dry conditions are essential. Some of these plants are decorative and a number, sphagnum moss among them, are useful. But in certain circumstances in the garden they are unwelcome, principally in lawns, and on pathways. Mosses are encouraged by consolidated and poorly-drained soil and they invade shady places, even though they require some light in which to grow. Shade often exerts its influence by retarding the drying-out of the soil. Permanganate of potash, calomel (a compound of mercury), sulphate of iron, mercurized turf sand, certain proprietary liquid killers, and others, are all easily available as means of moss control. Maintaining soil fertility should, however, come first. Prevention by this means is not only better than cure, it is also more relevant. Antidotes can clear moss, but if general conditions are conducive to its growth and allowed to remain so, it will return. Moss on paths, depending on the actual surface, is dealt with easily enough by applying chemicals, by raking, or on smooth surfaces by scattering sand and giving the path a good stiff brushing. But it is on lawns that soil fertility and conditions are obviously most relevant. On lawns it is insufficient merely to apply fertilizer. It is necessary first to deal with the physical state of the soil; the application of fertilizer can then follow. 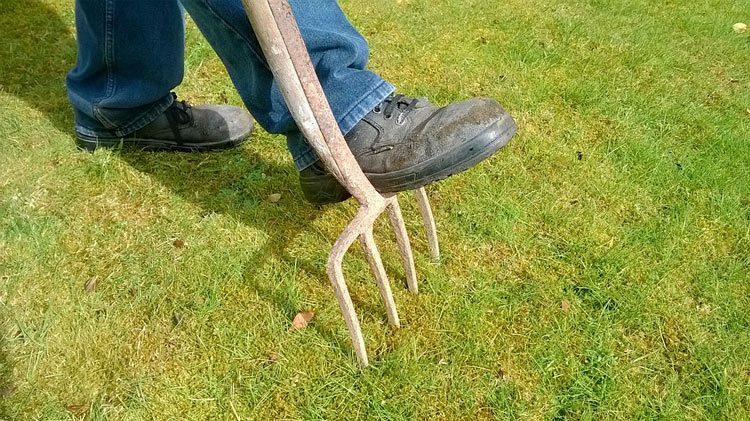 While it may be impossible to improve the general drainage, autumn spiking using a turf-piercing fork with hollow tines, plunged into the turf at about 16cm (6 in) intervals, immediately aerates and improves a compacted lawn. A mixture of peat and sand brushed into the holes—after the soil cores have been gathered up and disposed about the garden—completes the process. General aeration throughout the year can be done with an ordinary solid-tined fork, if it is desirable to improve the condition still further. Impoverished lawns, which are highly susceptible to moss invasion, require organic dressings in order to build up humus to encourage the growth of the grass. Autumn is a good time for applying such dressings. Spring is an excellent time to apply complete artificial fertilizers. Supplementary feeds at a lower rate may be applied in summer. A good scarifying with a proper lawn rake provides a good start to any lawn season. It encourages the growth of the grass and also discourages moss. It is important to remember that feeding must be balanced; indiscriminate use of fertilizers can easily spoil soil conditions, and may easily encourage moss to grow. Lawnmowers should not be set too low. Extremely close cuts can mow grass out and allow moss to invade. A combination of too low a setting of the blades and an uneven lawn surface will lead to ‘scalping’ when bare patches are left and, particularly in shady parts of the lawn such patches will quickly be taken over by mosses. The surfaces of the soil in flower pots often becomes covered with mosses and liverworts. These are seldom a nuisance where growing plants are concerned and they can easily be removed by hand. But moss growth may prevent the germination of tiny seeds. This can be obviated by keeping the pots in darkness until germination has taken place.